This book provides the first analysis and synthesis of the evidence of the earliest inhabitants of Asia before the appearance of modern humans 100,000 years ago. Asia has received far less attention than Africa and Europe in the search for human origins, but it is no longer considered to be of marginal importance. Indeed, a global perspective on human origins cannot be properly attained without a detailed consideration of the largest continent. In this study, Robin Dennell examines a variety of sources, including the archaeological evidence, the fossil hominin record, and the environmental and climatic background from Southwest, Central, South, and Southeast Asia, as well as China. He presents an authoritative and comprehensive framework for investigations of Asia's oldest societies, challenges many long-standing assumptions about its earliest inhabitants, and places Asia centrally in the discussion of human evolution in the past two million years. Robin Dennell is Professor of Human Origins at the University of Sheffield. A former Leverhulme Senior Research Fellow and British Academy Research Professor, he is the author of European Economic Prehistory and Early Hominin Landscapes in Northern Pakistan: Investigations in the Pabbi Hills. The Cambridge World Archaeology series is addressed to students and professional archaeologists and to academics in related disciplines. Each volume presents a survey of the archaeology of a region of the world, providing an up-to-date account of research and integration of recent findings with new concerns of interpretation. Although the focus is on a specific region, broader cultural trends are discussed and the implications of regional findings for cross-cultural interpretations considered. The authors also bring anthropological and historical expertise to bear on archaeological problems and show how both new data and changing intellectual trends in archaeology shade inferences about the past. 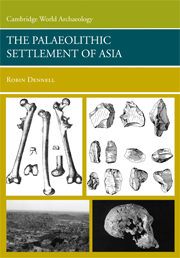 For all those – past, present, and future – interested in the early prehistory of Asia.